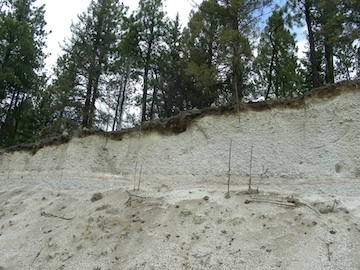 Tuff, tephra, tufa, travertine: what’s the difference? 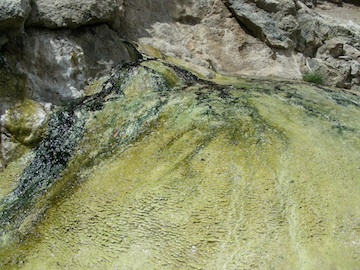 This must be tufa, right? We just learned about tuff. Well, no, it’s technically travertine. And why did they spray all that white concrete all over the rocks way out here? Wait! The “High Desert Field Guide” I just bought says that’s a pumice deposit, and geologists call it tephra. What a confusion of tongues! But as any student of the subject knows, the geological sciences are afflicted by a kind of logorrhoea when it comes to naming things. The geologist P. D. Krynine called stratigraphy “the complete triumph of terminology over facts and common sense”. And that’s just stratigraphy. Most people instinctively know that each of these words probably has something to do with volcanoes, somehow, and of course they’re right. Tephra refers to any of the fragmental material a volcano ejects, regardless of the size of the fragments. 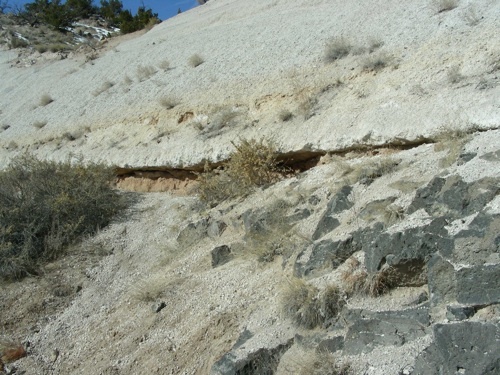 This includes primary material like ‘bombs’, ‘cinders’, and ‘ash” as well as blocks of rock torn from the volcano’s cone or carried up from crust. As long as this fragmental stuff lies loosely in cones or drifts or layers on the ground, it is still called tephra. 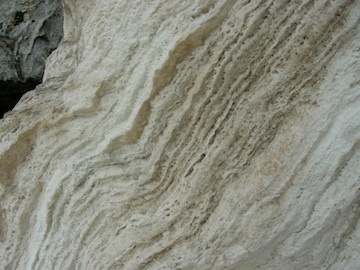 Once this fragmental material consolidates into a more or less firm rock, it is called tuff. 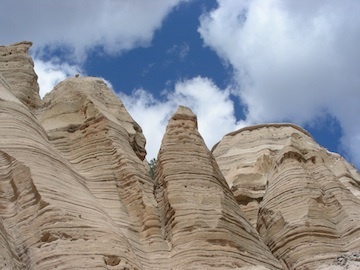 Some air-fall tephras are turned into rock – ‘lithified’ is the term geologists prefer, which means ‘turned into rock’ – by compaction and by ground water cementing the particles together. 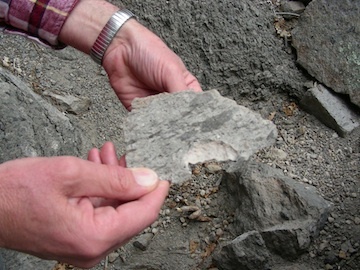 But most tuffs are formed almost immediately upon cooling, since the hot glassy fragments that make up the bulk of volcanic ash in pyroclastic flows are soft and hot enough to fuse together. This process is called welding. Depending upon the heat and size of the eruption and the proximity to the vent, a tuff can be welded weakly, or it can be fused together so firmly that you can scarcely distinguish it from lava. 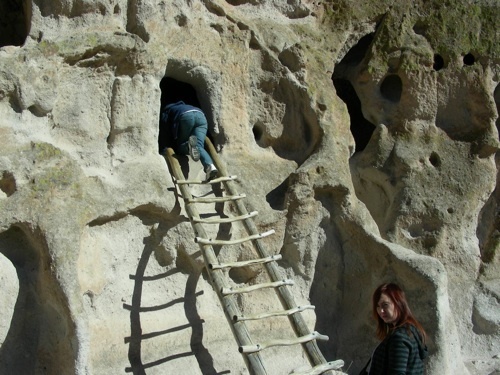 Much of the Bandelier Tuff that visitors see on the way to Bandelier National Monument is only weakly welded, and once the weather-hardened rind is broken through, you can gouge out the tuff with simple tools. 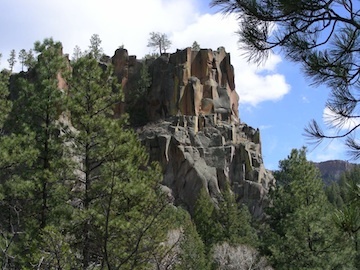 As you drive from Bandelier on into the Valles Caldera National Preserve, you might notice the tuff getting firmer and darker, breaking into hard plates of unmistakable rock. 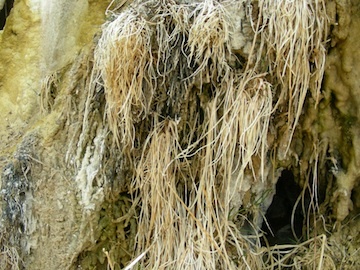 Firmly welded tuffs deposited from hot pyroclastic flows of ash are sometimes called ignimbrites. You really can’t help loving this word: “glowing cloud stone”. 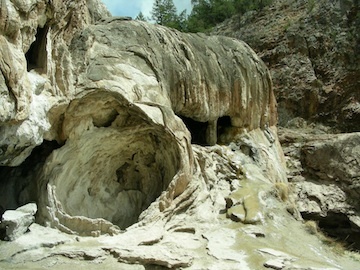 This entry was posted in Nature&history and tagged Bandelier, geology, mountains, New Mexico, Santa Fe, tufa, tuff, volcanic. Bookmark the permalink. 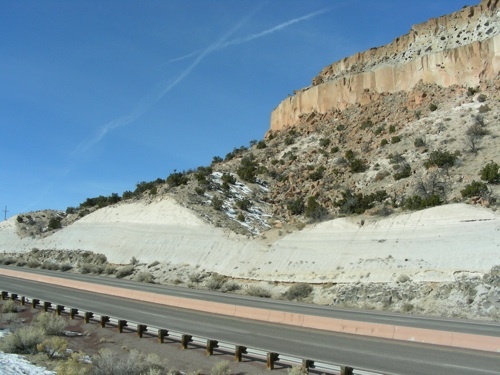 3 Responses to Tuff, tephra, tufa, travertine: what’s the difference? I loved reading this. Those of us who live here often gradually pay less attention to the formations around us until someone puts forth an interesting portrait. And then we look again. Thanks for offering us this lesson in terminology and beauty. I loved reading this as well! Of course, I love almost anything having to do with Outspire- every association, no matter how minor, always results in learning,smiles and fun! Thanks Laurie and Janet! Also nice for us to know that someone is enjoying the information!